The new benchmark for all-day kneeling ergonomics, comfort and functionality. Provides the ultimate stability while maintaining easy side-to-side movement. 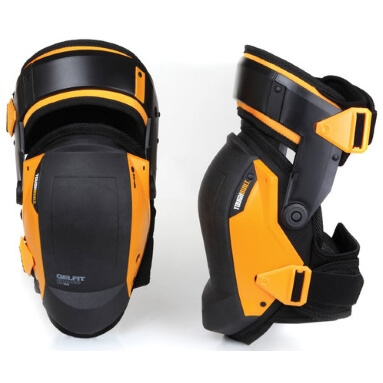 Integrated thigh support keeps the knee perfectly centered, never twisting out of the kneepad. The lower platform raises the shin off the ground, alleviating pressure on the ankles. Ergonomic gel and foam design embraces the natural shape of the knee and upper shin, maximising pressure distribution for an extremely comfortable fit. Rugged double-injected shell with non-slip rubber. Combination elastic/EVA/buckle thigh and calf straps comfortably hold their place without digging in. Dimensions: Width 34.2cm (13.45in), Depth 19.5cm (7.69in), Height 43.4cm (17.10in). Materials: Primary - 1680D polyester, Secondary: HDPE plastic.